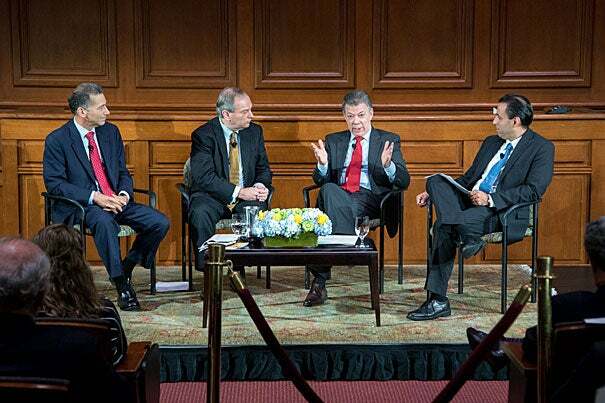 Colombian President Juan Manuel Santos (center) received the Great Negotiator Award at HLS. Santos was honored for his work to end Colombia’s 52-year civil war. Santos was honored for his work to end Colombia’s 52-year civil war and forge a comprehensive peace agreement between the government and the Revolutionary Armed Forces of Colombia (FARC). The conflict has claimed more than 220,000 lives and displaced more than 6 million people. The ceremony at the Law School on Wednesday — which included a three-hour panel discussion with HLS Professor Robert Mnookin and others — was a kind of homecoming for Santos, who earned a mid-career/master’s in public administration from Harvard Kennedy School in 1981. A former journalist, he was also a Nieman Fellow in 1988. At Harvard, Santos had studied with the late Professor Roger Fisher, co-founder of the Program on Negotiation and the Harvard Negotiation Project. On Wednesday, it was Santos who was the professor, guiding Harvard faculty and students through the intricacies of his six-year negotiation. Some of his tactics were traditional strategies; others, such as making living victims central to the negotiation process during an armed conflict and placing a special focus on women, were implemented for the first time. “I was convinced this war had to end at the negotiating table, otherwise it could last 20, 30, or 40 more years,” said Santos. With mountains and jungles and money from drug trafficking and illegal mining, “Colombia is the ideal country for guerrilla warfare,” he said. Santos was elected the country’s president in 2010 after serving as defense minister under his predecessor, Alvaro Uribe, overseeing a strong military offensive against FARC. He knew adopting the posture of a negotiator would surprise the people who had elected him. Santos oversaw a team of negotiators who met with FARC leadership in Havana. For 18 months, the negotiations were conducted in secret. Both sides were highly skeptical about the possibility of success and used the time to build trust. In the meantime, they remained at war — as they would throughout the negotiations. Santos took discreet measures to gain FARC’s trust, including authorizing the Colombian military and police to take a humanitarian approach and provide medical treatment to FARC’s wounded. “The only way for the military to gain legitimacy was by respecting the population, but also your enemy,” he said. The talks covered five main areas: rural development, political participation, drugs, victims, and disarmament. To aid negotiations, Santos built relationships with neighboring countries, including Venezuela. And he engaged facilitators from Cuba and Venezuela — chosen by FARC — and Chile and Norway. Santos also had four principle advisers, one of whom was Bill Ury, a distinguished senior fellow at the Harvard Negotiation Project. Ury was a panelist at the Law School on Wednesday, along with Harvard Business School Professors James Sebenius and Deepak Malhotra. Sebenius observed that Santos’ negotiations gave unprecedented attention to living victims by calling for reparations, justice, truth, and non-repetition of the harms they had suffered. Ury called the victim-centered process a key innovation of the Colombian process. Santos said many people had believed that victims would refuse to allow any benefits for the perpetrators of crimes against them. Instead, victims insisted the negotiations continue because they didn’t want to see others suffer as they had, Santos said. The two sides reached an agreement in 2016, which was put to a public referendum in October of that year. Against expectations, it lost by a paper-slim margin, with 50.2 percent against and 49.8 percent in favor. Santos pursued another round of negotiations to win over opponents, and a revised agreement with FARC was signed in November 2016. This time, both houses of Congress and the Constitutional Court approved. Santos wrapped up his return to Harvard with a visit to the Widener Library, where he presented Sarah Thomas, vice president for the Harvard Library and University Librarian, with a copy of the Colombian peace agreement. Professor of Law Matthew Stephenson is organizing a conference on populist plutocrats: politicians who exploit anti-elite sentiment to win elections, only to use the presidency to advance the interests of themselves and their allies.